This shed has been created using 12 mm tongue and groove materials. This works very hard to stop rainwater from settling and therefore causing a problem. So you have an instant defence barrier against damp and rot. In addition, you have a very good looking shed, one which has a sizeable door as well as two large windows that happen to include real glass. It’s a lovely looking building and should grace any garden. 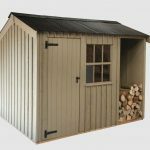 The Woodland Trust shed collection has gained an exceptional reputation within the industry so we expected this shed to be a high quality, great value model. We certainly weren’t disappointed. While boasting a fairly basic aesthetic design, the shed benefits from a range of exceptional features and high quality construction. We were particularly struck by how spacious the doorway is, enabling you to transport both large and small items with no hassle. Two large styrene glazed windows – The shed benefits from two large styrene glazed windows, providing plenty of natural lighting within the shed. Styrene is designed to be completely shatterproof. 2×2 Framing – The 2×2 framing provides excellent strength to the shed, ensuring a stable, durable design. 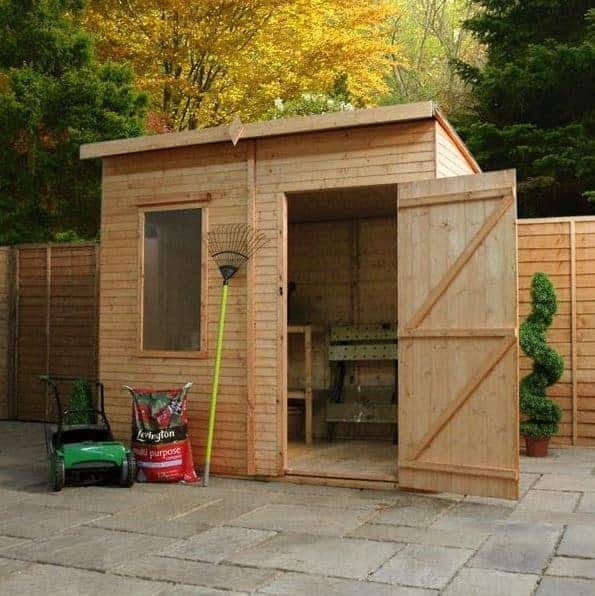 Woodland Trust approved – When you buy this shed you are helping to conserve Britain’s woodland. Butterfly catch – Ensuring the door to the shed closes properly, the butterfly catch is an excellent addition. It also prevents the door blowing open in windy weather. 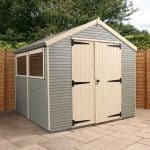 Made in Britain – The shed is manufactured in Britain which means you are helping to UK’s manufacturing industry when you buy this model. 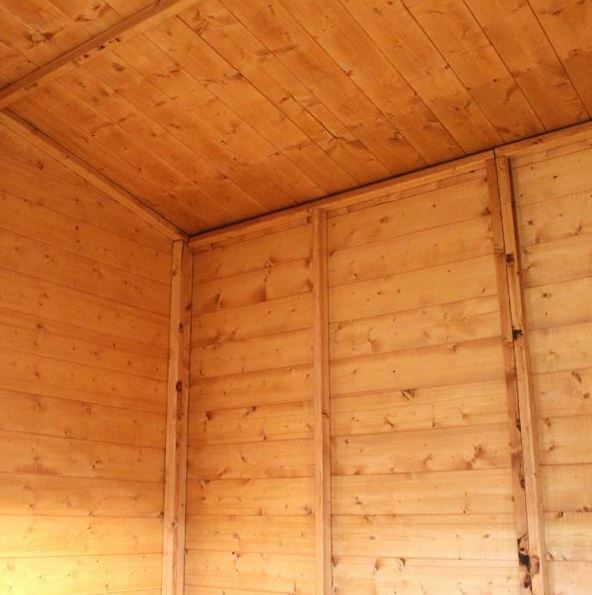 16mm Shilap Plus Cladding – The unique 16mm Shiplap Plus Cladding gives the shed an extremely tough weatherproof design. Tongue and groove floor and roof – Both the floor and the roof benefit from tongue and groove construction. The floor measures 16mm, while the roof measures 12mm. Choice of door and window placement – You can customise the shed by choosing where you want the windows and door. 10 year anti-rot guarantee – Never worry about rot thanks to this exceptional guarantee. 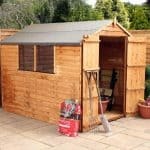 As you can see, the features help to ensure that the shed has a strong, safe and durable finish. The 2×2 framing and shatterproof styrene glazed windows ensure this shed is safe and sturdy. You can tell just by looking at its design that it has been created with safety in mind. There are no rough edges so splinters won’t be a problem. 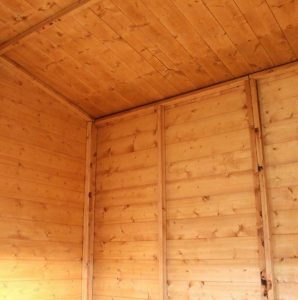 The Shiplap Plus Cladding also makes the structure of the shed extra tough. The lack of a lock may be a safety concern; especially as the shed has large windows. So if you’re planning on storing anything of value in there you will need to invest in a lock separately. 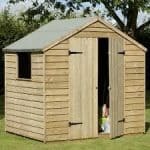 All Woodland Trust sheds are designed to be easy to assemble. While you will be able to construct it as a 1 person job, we recommend 2 people take on the assembly. This is because while it is easy to put together, it does require a lot of heavy lifting. It is also safer to have 2 people overseeing the build. 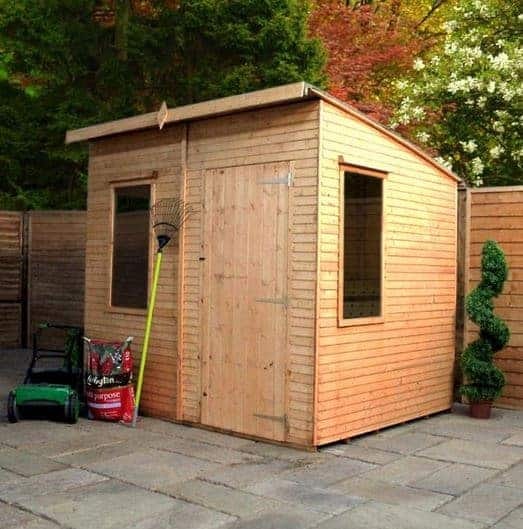 Compared to other sheds in the same size bracket, this Kurva Curved Roof Shed has some outstanding features. We like the fact you can choose where both the windows and the door is positioned. It enables you to fully customise the build to fit your garden’s layout. 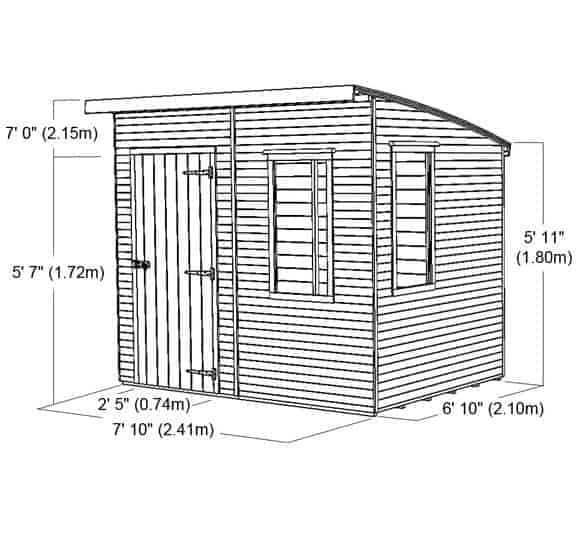 Once put together the shed is extremely sturdy, offering a safe, durable design. While some may find the unpainted look a little too dull for their tastes, it does provide a very rustic style to the garden. You can also paint over it if you want to. While the shed is built with safety in mind, it doesn’t offer much in terms of privacy. 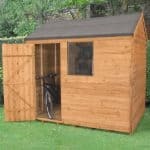 On the one hand, the large windows help a lot of natural light into the shed which means you don’t necessarily need the garden building electrical pack. However, on the other hand these windows let people look inside. So if your garden isn’t very secure, potential thieves could see it as an opportunity. Therefore we recommend you avoid storing anything valuable in the shed. You may also want to buy a lock to further protect it from thieves or young children. We think the Woodland Trust 6×8 Kurva Curved Roof Shed is one of the best on the market. It offers excellent value for money thanks to its tough, weatherproof design. 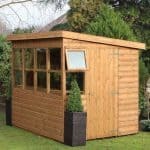 It is ideal for those looking for an attractive small shed to store everyday garden essentials.